This is our lotus birth baby. We had considered the idea with our first child, and I had even prepared a beautiful silk bag, with a lotus painted on it, to keep his placenta in (pictured). We had bought the salt and had everything ready … but still we had reservations about it. I was still having issues getting over the ‘ick’ factor. As it happened, he was born by emergency cesarean and so the decision about whether to lotus birth or not was made for us. There was no way our hospital would consider such an option, and the nurses were baffled by our request to take his placenta home with us for burial. It was referred to as ‘dead meat’ and handed to us in a white bucket with the instructions: Get rid of it today. I appreciate the fact that they didn’t want an organ sitting in a bucket of blood in the maternity ward. Neither did we and so my husband took it home and froze it as soon as he could. Later (almost 2 years later in fact!) it was planted under an avocado tree that had been gifted to our son. Lotus Birth is the name given to a process of placenta-care after the completion of a baby’s birth. The umbilical cord is not cut, and the placenta is allowed to remain attached to the baby until it detaches of its own accord. This is a good question – there are benefits to leaving the cord attached to the baby for longer, as it allows the baby to receive the full compliment of blood and nutrients that are stored within the placenta. This can be achieved without a lotus birth, just by letting enough time for this process to be competed before cutting the cord. It isn’t necessary to leave the cord attached after these nutrients have journeyed across to the infant. So the whole affair of having to drain and clean the placenta, then dry it and salt it and care for it, as well as the baby, until it detaches seems like a messy business, and one that most people wouldn’t want to be bothered with after the messy business of birth. To be honest, I can’t tell you exactly WHY we did it. There was nothing scientific involved. It just felt right, and in the end, after our daughter’s birth it wasn’t even a conscious decision at all. The placenta felt like a part of her … and it wasn’t gross at all. It was beautiful. The opportunity to examine a placenta doesn’t arise very often, so if you do get the chance then take it! Our midwife talked us through how it was made up. She took off the sack that our baby girl had been tucked inside for so long…and it was the softest thing I have ever felt in my life. I wouldn’t mind being wrapped up in that! Our midwife showed us the veins on the placenta, the ‘Tree of Life‘ pattern was clearly visible. We looked at where it had been attached to my womb. Our son was three and a half years of age and was very fascinated by this organ. We told him it had been her little pillow when she was inside me, and from then on, it that was what it was known as. How do you care for the placenta? Our daughter’s placenta was drained through a colander into a bowl. When this process was finished it was patted dry and rubbed with coarse sea salt and powdered rosemary. Then it was allowed to dry naturally in the air, only lightly covered with a muslin cloth. At night time we wrapped it up in a few towels, and a plastic bag, tucked it into the placenta bag and put it next to her. The cord dries stiff, and it is interesting how quickly it really dries out! So this means you need to be careful about how you position the cord when it is drying so that you can easily move the placenta about when you are changing or dressing baby. I believe you can soak the cord in water for a while to soften and re-position it when it is drying, but we didn’t need to do this for her. It was as if she had a little swivel attached to her belly button and we managed ok.
Only at one point, around about day 3, did we begin smelling something unpleasant. We had been changing the salt and rosemary on the placenta each day so it wasn’t coming from there at all, but instead from her belly button. An infection in the belly button could lead to a fever, but our midwife checked it and treated it with pure lavender oil before it reached that point, and by the end of the day the odour was gone and there was no infection at all. It wasn’t so bad for us. No trouble at all really. We had already told family and friends about our plans to do this, and I had a few friends who already had successful lotus births so I was confident we would manage. Not everyone understood why we would consider such a decision, and that is fair enough, sometimes things are just difficult to explain. Matters of spirit. But those who were skeptical of the idea remained quiet and just observed, and we were grateful for the space we were given to explore the peaceful potentials of our daughter’s birth. Having the placenta attached to the baby meant, for us, that she was disturbed as little as possible. She lay with me, peacefully, on the bed and was only picked up or moved when she was being changed or dressed. Yes, it was a little bit awkward sometimes, especially when trying to find a comfortable position to breastfeed, but this was not an insurmountable problem. We generally kept the placenta only lightly covered, to speed the drying process, but we used the placenta bag when visitors came. They never even noticed, as often the placenta was wrapped up with her in a muslin cloth anyway, and we were not encouraging our visitors to pick her up and cuddle her in her first few days in any case. Plenty of time for cuddles. The placenta detached of its own accord about 9am on the 4th morning. Our baby girl had been holding on to it in her little hands for about half an hour before hand. The whole time since her birth she had not cried. She had cooed and gurgled peacefully, but never uttered a cry until the day her cord came off, and even then it was a pathetic little cry! 1) She was allowed to adjust to and absorb (literally) her new life outside of the womb in her own time and space. 2) The process of her birth was honoured and allowed to unfold in the way it needed to. 3) She was a very peaceful and calm baby throughout this process. 4) Caring for the placenta was like a ritual of honour. It involved my husband and my son in a loving and compassionate, but also very practical way. I concerned myself with the recovery from birth, bonding with my baby and the journey into breastfeeding, and they helped with the care of the placenta and our home. 5) Visitors are not inclined to cuddle a child AND a placenta, so she was not introduced to too many new people, (and their air-borne germs!) in the first few days of her life. Our guests were respectful and reverent and admired her from the edge of the bed. She was not carried out of the bedroom. She was not carried anywhere, but allowed to remain in her state of blissful peace. 6) And as previously mentioned Baby receives all possible nutrients from the placenta in the time before it begins to dry. Almost one-third of the baby’s blood is still contained in the placenta at birth. It is really important that the baby receives this!! When the cord is cut too early, or when cord blood is harvested, this means your own baby is missing out on vital nourishment, and then has to work hard to MAKE new blood to replace the blood contained within the cord and placenta. I am aware that there are many people who have reason to be grateful for the amazing properties of cord blood. It is like no other blood and is only found in infants, whose bodies and internal organs are still undeveloped. It is a decision that has to be made – allow other people to benefit from this blood, and help them recover from a life-threatening illness, or allow my own baby to use this blood to become the healthy person they need to be. Yes I would, and I plan to. Our next baby is due in July, a nice cool month to do lotus birth! Our experience with lotus birth was calming and peaceful for everyone. Sure, there is no real reason to do a lotus birth, but neither (if you or your baby is not in distress) is there a reason NOT to. If the placenta is properly attended to, and your midwife is observing the process attentively to guard against any possible forms of infection, there is no risk whatsoever. Absolutely I would do it again. How interesting. I read about lotus birth a while back (long after mine were born) and always felt I would do it if given the chance. I now find myself on #3, due this spring, and having to choose between lotus birth and placenta encapsulation. I am doing another homebirth so early cord cutting etc won’t be an issue, but from what I’ve learned, there’s no way to do both: Lotus birth AND placenta encapsulation. I don’t know…. Yes you can do both. I took a small amount of the placenta to keep in the freezer and prepare a healing remedy from. I decided not to consume it myself as I was feeling very good after the birth. I do have a friend, however, who had a lotus birth with her daughter, and consumed a small amount of the placenta in a smoothie to help her recover from the birth. You take a piece before you begin curing it with salt. Oh boy! This is great to know. I never thought of that. Thanks! I will look into this further and plan, plan, plan! Beautiful explanation of Lotus Birth!! I hope you don’t mind but I shared your link on my FB page http://www.thenurturedcenter.com. I had mentioned Lotus Birth in my Maternal and Child Health class the other day and no one had ever heard of it before. I don’t mind at all, thank you very much. I am surprised that more hasn’t been written about Lotus Birth on the internet … its quite a hot topic! May I use your story and picture for a class presentation? Incidentally I will add that my next birth was not a lotus birth – BUT the hospital was prepared to do a lotus c-section for us up until our little one began showing signs of distress. In the end I am glad we did not do it again because I had a wound as well as a baby to care for BUT I am very very pleased with the openness of our hospital to consider lotus birth in a clinical setting. 1) In your opinion, do think it is safe to have a water birth along with a lotus birth? I am just curious about the bacteria present in the water itself, (not from any of my baby’s body fluids). It may seem silly to ask, but with all of the contaminants in some water systems these days, would it be advisable without first filtering the water in the birthing tub (which could be A LOT of water)? 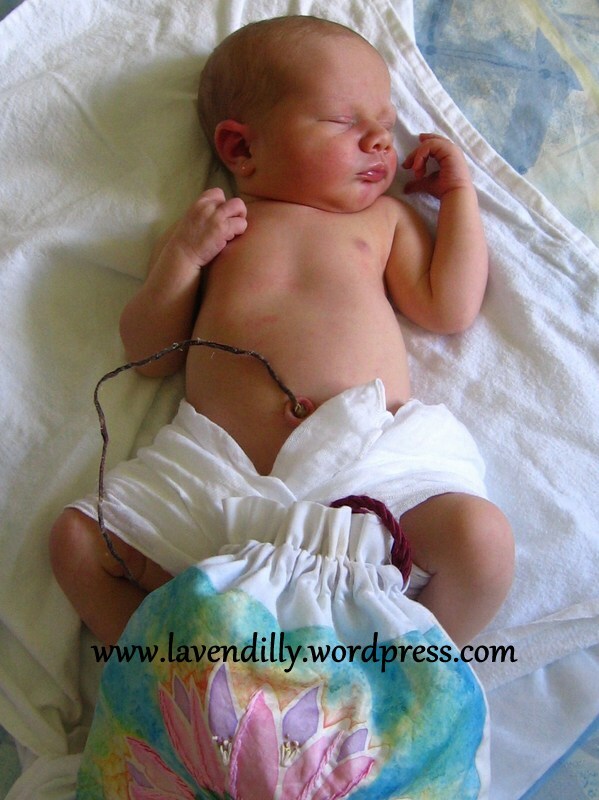 2) With lotus births, how naturally does the cord dry up and fall away? Is there any advice on how to safely remove the cord from babies belly (without cutting it) to avoid tearing or having it be “cut” too short or too long? Or does it just fall off naturally after the placentas pulse dies down? I understand the uses of lavender oil for killing bacteria, but could something else be applied to help ease the process? Thank you for your blog. I felt so calm and peaceful reading through your experience. I can only hope to have our future lotus birth be as blissful as yours. This blog records only my experience. I have no specific knowledge of midwifery or lotus birth, so please do ask these questions of your midwife to ensure you have the answer you need. But I can answer with my experience. My lotus birth came after a water birth. We did not filter the water in our birthing pool – but we DID clean and sterilise (as much as possible) the birthing pool before we filled it. It was filled with ordinary tap water from the laundry. With the umbilical cord, I was surprised at how quickly it dried up. We did nothing but pat it dry and salt it and the placenta. It did the rest itself. My baby gave the cord a little tug with her own hand and it just fell away when the time was right.